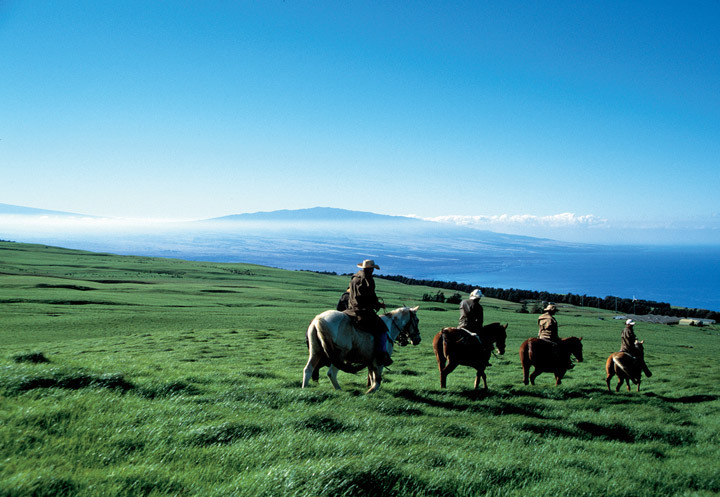 One of the most popular activities on the Big Island is horseback riding. This is only appropriate given that this tropical paradise is also known for its expansive upcountry ranches, colorful paniolo (cowboys), and has more horses and cattle than any other Hawaiian island. The varied terrain and eye-popping vistas combine to make exploration on horseback a must. The majority of trail rides exist in the northern part of the island. Waipio Valley is a stunning and popular area, offering rides that take you places no vehicle can go to such as waterfalls and taro patches, cliff edges and valley floors. In the Waimea and Kohala areas, riding across the range of a working cattle ranch is a wonderful way to experience the life of a Hawaiian cowboy. In the South Kona area, several stables take you right down to Kealakekua Bay and the Captain Cook Monument where you can take a break from the trail with a refreshing swim and picnic. On the east side of the island, a few rides are available that combine horseback riding with camping and packing trips. When shopping for the trail ride best suited for your needs, be sure to ask about required riding experience as well as any age and weight restrictions. Most companies offer amenities, such as snacks or picnics, and usually have both morning and afternoon schedules, complete with historical and cultural narrative.